» Forum » All Pinball » ColorDMD Avengers - Released!!! » ColorDMD Avengers - Released!!! Holiday Colors! Avengers Video Preview! 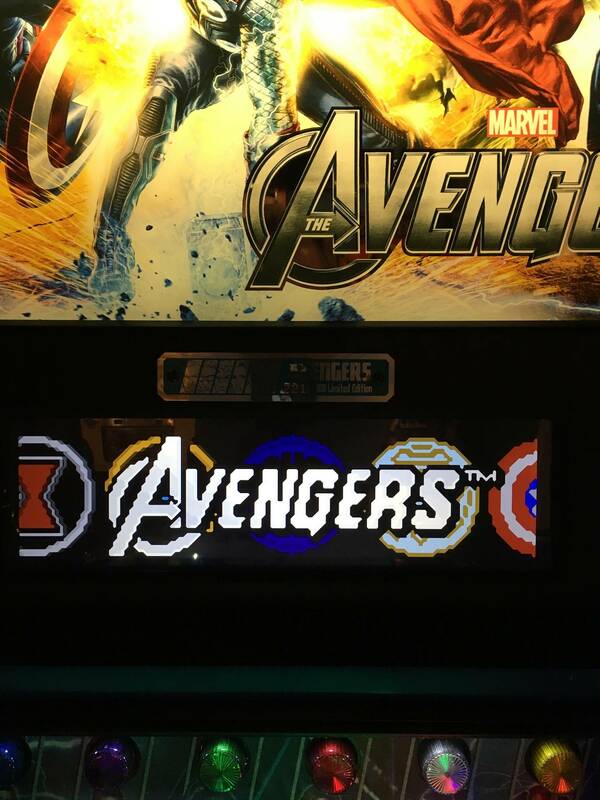 ColorDMD Displays is excited to announce support for Avengers pinball machines, just in time for the holidays! This is the 31st multicolor release for the ColorDMD display platform, and 17th new title release in 2015! The dots for Avengers are nothing short of incredible, and even more so with the addition of color and upscaling. Don't miss the link to the video preview! Avengers was colored by Jean-Francois Paré, an avid fan of "Marvels" and pinball. JF resides in Quebec, Canada with his wife of five years, and works as a business insurance broker. He began collecting pinball machines 5 years ago and plays nearly every day. JF always likes a challenge and decided that coloring Avengers was one he had to take on! Avengers doesn't disappoint with great depth and range of detail in the animation in the game. It was certainly a labor of love, and JF credits Eric Priepke and Chris Enright for their support in helping him to complete this project. The ColorDMD for Avengers pinball machines leverages the company's easy-to-install ColorDMD SIGMA platform and supports six different rendering styles. Multicolor operation is enabled through free download and installation of a game-specific ROM using a USB drive. The display may be reconfigured for use with any supported title. Displays are in stock now for immediate shipping, The color ROM for Avengers is targeted for release on Thursday, December 24. Thank you for your continued support! For additional information, including upcoming game previews, please visit us at www.colordmd.com! WOW that looks GREAT, thanks Jean-Francois, VERY well done. Stunning, just stunning! Great job JF. Looks great. Best dots on an ok game. Almost makes me want to own it for a third time. I hate on TAV a lot but THIS IS FIRE. Buy it. Great work JF, it looks amazing! Thanks.I had a lot of fun doing this title. I hope you'll enjoy the game... now in colors ! Killer! If I still had it, I'd add ColorDMD for sure! Looks great. Nice to see scan line mode getting some love in the pics. That's my favorite on newer "hand-drawn" (hand-dotted?) DMDs like Metallica. Game is awful, but the dots are great. ColorDMD will definitely add to the experience. I just ordered one. Can't wait to see it in my game. Looks awesome. I miss my Avengers. If only we could get spiderman, that would be awesome. my suggestion would be to play this game with Hires mode. I find the art of the game looks like cartoon art. dotXL or scan mode still good too. But, my best mode is Hires for this game. And, i didnt touch to the contrast and brightness. Some more stills from the game. That looks great. I offered to help coloring but it looks like you guys don't need it. 17 titles in 2015! Amazing. Randy, you'll maybe make me change my mind about the scan mode. Like i said, my favorite mode is Hires. But, i played couple times today and the scan mode looks very nice. I did all of my tests with Hires and dotXL.... But, this scan mode is really good too. Last look before release. JF did a great job with this title. Didn't realize how good the dots actually were - there's some decent image and animation work in there. SCAN looks to be great from the pictures. I recently switched my MM from SCAN to DOTSXL and I honestly have to say the Dots look horrible to me after having SCAN. Like i said, its almost the same thing for me. I tested the game with Hires ( it looks very nice too ) but Scan mode looks better , i think. I have an AC/DC with colordmd display and i have the scan mode on this one. For Avengers , i think all of this more will fit perfectly. At the end is always the person who chose what he wants on his screen. Looks awesome. Congrats Avengers owners! The color ROM to support Avengers pinball machines has been posted and is now available for download from our site! Long ago, I decided to focus all of my splurge mods and affection on my Tron, leaving my Avengers pretty much stock and forlorn. After seeing this in person, however, I gladly plunked down money for the Color DMD. Really adds to the game. Money well spent! Need to order 1 or 2 more to make sure I keep ahead. I've made a decision that I am only going to buy games that ColorDMD has finished. Any news on when we can expect to see the new updated ColorDMD ROM for the latest Avengers code update? I know it is being works on. Be patient though. Then you are in luck. Two of the games (WPT and Xmen) have been colorized. Time to dump out a lot of money and get some more games. Yea I should be getting a Getaway II in the coming weeks. The update was released a couple days ago. That one-line makes it sound like it was no big deal to update. It was a big deal. Battle for Earth is only partially finished, but rather than hold up the fix for just that part, Randy put out an interim update. Any word on finalizing the coloring for Battle for Earth (& any other outstanding graphics)? Sorry, but nothing to report on Battle for Earth at this time. It's a big job with some technical challenges to overcome. ColorDMD support is limited to the 1.4 game code until we can find time to take another look at it. Any updates on battle for earth, haven't made it there myself but hoping one day to see it in glorious color. This game looks great as is, just wondering.